Want to learn about double stops? The style of Chet Atkins? Then Bobby Howe is the instructor for you. 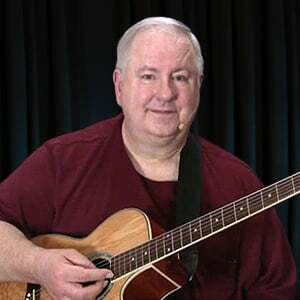 Coming to you out of Illinois, Bobby is an experienced teacher who will show you everything from how to hold your guitar to intricate fingerstyle arrangements. Every guitar player should have a working knowledge of how to change his/her guitar strings. What happens if you break a string on a gig? You should know how to put on a new one. You become a better player if you know your instrument better. This tutorial will help you do that. Old Joe Clark is a traditional bluegrass standard dating back to the 19th century. Here, three-finger "banjo-roll" style guitar picking is explained in great detail to get that fast, rolling sound on acoustic guitar. We take advantage of and use the open G triad tuning of strings 4, 3 and 2 to help us along. A fun, driving backing track is used to make the tune complete. In this tutorial, I'll first introduce the elements of the Chet Atkins style; then for those of you new to fingerpicking, I'll also talk about how to use a thumbpick and fingers. We'll learn two pieces that I wrote - to learn how to play rhythm and melody at the same time - then walk through those pieces measure by measure, looking at both the right and left hands. Finally, we'll walk through several "banjo rolls" with Atkins-style chords. In this four lesson tutorial, the student will learn the theory, the mechanics, and the fingerings of double stops and why they work as they do. Simply put, double stops are the approach of playing two notes at once that are harmonized. I'll start off by playing a short original tune that's based on double stop, then use the C and G major scales to demonstrate this technique. Parallel thirds (double stops) are commonly used in many styles of guitar playing. Both non-inverted and inverted thirds are used. Unfortunately, it's not a nice and neatly packaged concept. We commonly move back and forth between both types while playing the same song. The learner will understand the differences between the two types upon completion of this tutorial. Material from this tutorial builds upon material from the previous two tutorial sessions, Double Stops - How They Work and More About Double Stops. This tutorial introduces 5ths and 7ths as components of double stops and gives multiple examples of how to play them. I have received e-mails from subscribers requesting more lessons on double-stops similar to what was done on the lesson for the Wabash Cannonball. This song Wildwood Flower is the next in the series. Red Wing is an old American traditional fiddle tune which for this tutorial series has been arranged and adapted to the guitar. This arrangement greatly takes advantage of the use of hammers and pulloffs in order to play it. The learner will understand the differences between split string and adjacent string pulloffs. Several subscribers have indicated an interest in learning more about the Chet Atkins thumb and finger style, so this tutorial has been created to go into quite a bit of detail to show the learner how to learn it. In addition to learning about how fingerstyle jazz works as far as the right hand is concerned, you will also learn many advanced chord shapes such as M7, min 7, aug 5, flat 5, 9th, 11th, 13th, etc.